Yesterday was one of those magical travel days we have read about in other peoples’ blogs and I honestly didn’t really think it would happen to us, but it did! It did! It did! A couple of days ago we were minding our own business walking down the street when a lady asked us if we speak English. Yes. Then she told us all about her restaraunt and invited us to eat there for dinner. (Which we did and it was really fine dining in a brew house (Monteverde Beer House)). The owners, Merav and Uriel Ronen, are Israeli and we had the best hummus, kebabs, and bread…oh the bread! was just so tasty… we will be back tonight, in fact, with some other traveler friends. Anyway, we all got chatting and seem to have the same sense of adventure. They left Isreal to live in Costa Rica for awhile and have done other traveling – so they probably know exactly what it feels like to be in a new place and not really know the non-touristic places to go. 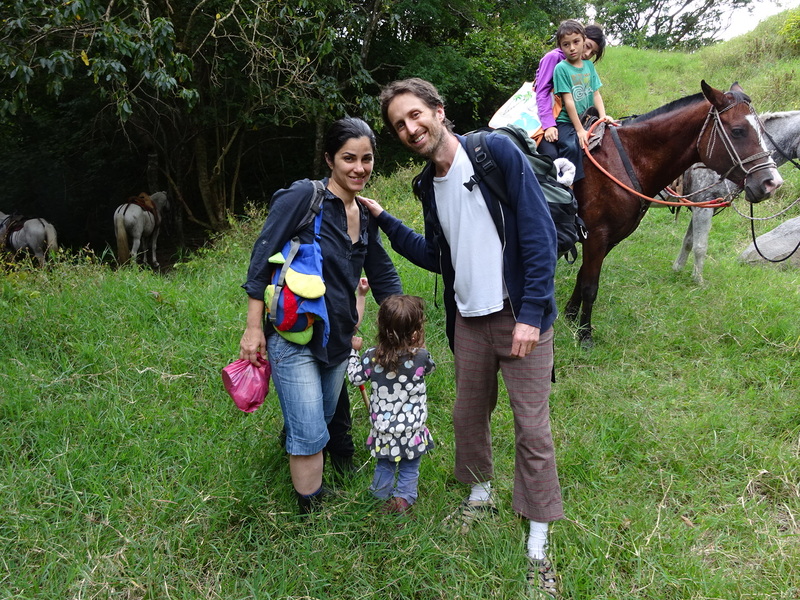 One thing lead to another and Merav invited us to join her and her family at a local “finca” – farm. Aaron and I used Married-People-Telepathy to exchange “LET’S DO IT!” silently through the ethers and we accepted the offer. Less than 24 hours later we were meeting them and another family for a big day out. 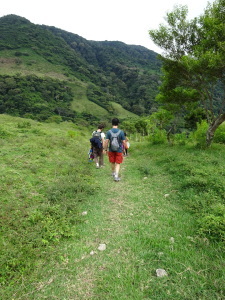 Hiking down and through the valley. The plan was to go to the farm, rent some horses that we would ride way down into the valley to a hotspring and there we would lounge around in the spring and have a picnic… and that is pretty much what happened, except the farmer was gone so we had to walk down the valley — no problem really. It was stunningly beautiful and we kept tripping as we were watching the scenery rather than the trail! 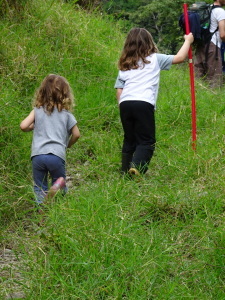 The three and five year olds practically raced to the bottom. 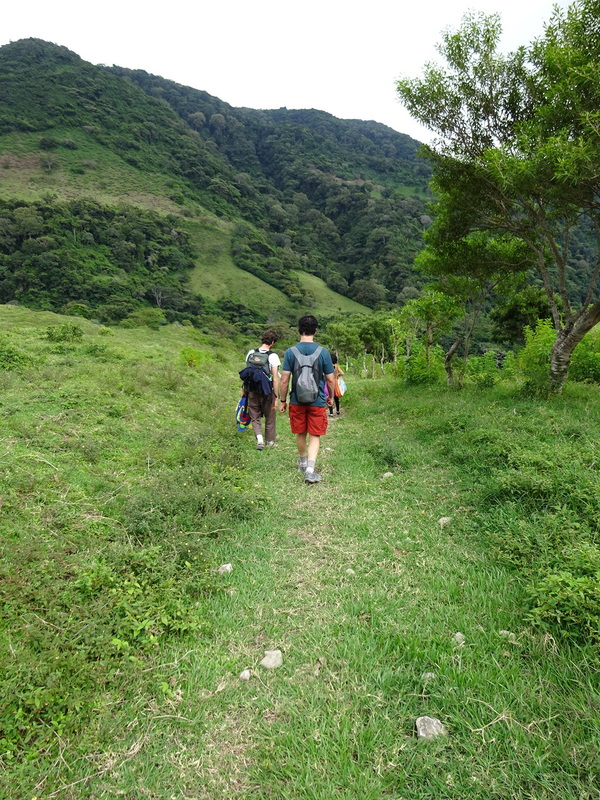 It was a lovely walk through cow and horse dung filled trails – which might not have been an issue, but I had decided to wear sandles. It made sense when I left the hostel – sandles and water are perfect. Sandles and doo doo, not so much. So, with Tiny Tim’s “Tip Toe Through the Tulips” playing in my head, I very carefully walked through the cow pasture without a complete disaster. I have to say it was incredibly beautiful when my eyes left the trail to look around…you might say bucolic, in fact. The cows were really pretty – one looked like a calico kitty. Crazy! 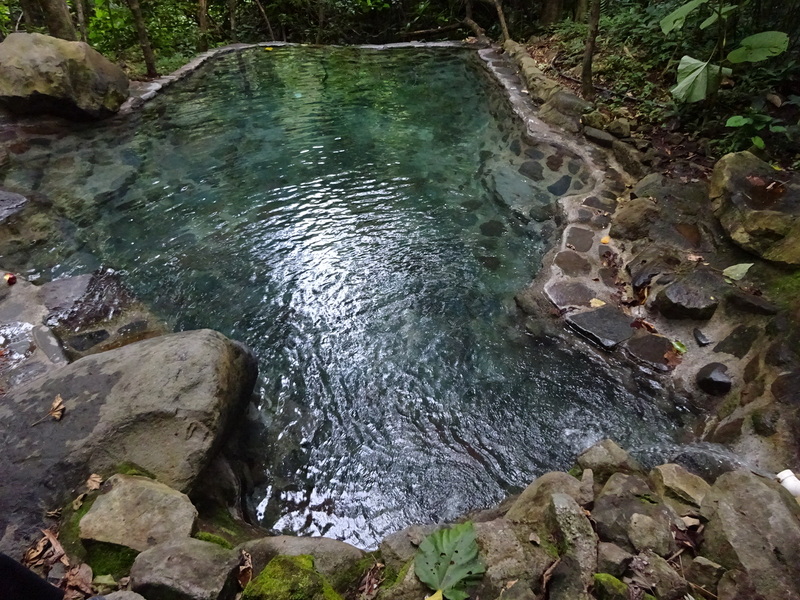 The hotspring was a beautiful stone pool with a constant stream of bathtub-warm water filtering through. Far below us was a cool stream that you could look over the side of the spring and watch. It was very, very, very relaxing and we had it all to ourselves. I can’t think of a spa I have been to that is as nice. 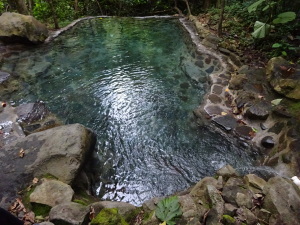 This is one of the two hotspring pools. 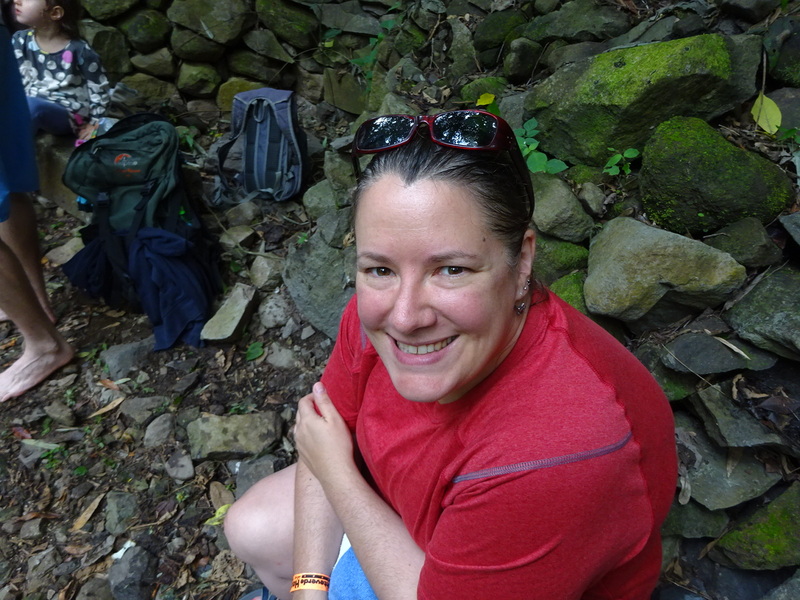 Happily the farmer brought horses down to meet us while we were splashing away, so we had a lift up the valley – which was great, because after that wonderful experience we weren’t looking for another Cerro Chato hike back out. On the other hand, it has been a looooong time since either Aaron or I have been on a horse. Just getting on was a bit of an ordeal, but we persevered. My horse kept stopping along the way, though – not liking hauling me up the hill, I assume. It was about a 20 minute ride straight up the rocky dung path. I just tried to (1) hang on and (2) look ahead or at the view…while (3) trying not to pay too much attention to the path because that was just kind of scary. It was a good first mini-horseback-riding-test as we’re seriously thinking of this amazing horseback safari/trek when we’re in Mongolia – more on that in a later post. Back at the farm, the farmer’s wife gave us cornbread and honey, called us a taxi and waved us back home. 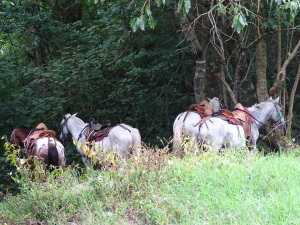 Horses waiting to return us up the valley. Our new friends Uriel and Merav with Talma. Tom Tom and Aoki on the horse. It was an absolutely delightful day. The kind of day that would have never, ever happened except that we met this wonderful family that was kind enough to invite us. We feel very lucky. They have invited us to come back after Mongolia and go into business with them. Wouldn’t that be something? I seriously doubt that will happen, but after this trip, who knows??? Terrific! Good for you two for trusting when to say yes. Ohh, that spa…. We’re quite enjoying it ourselves and glad to have you along to experience it with us! Way more fun for us that way! Pingback: No Map Required | Birthday Re-Do Underway – Step 1 : Horseback Riding! !